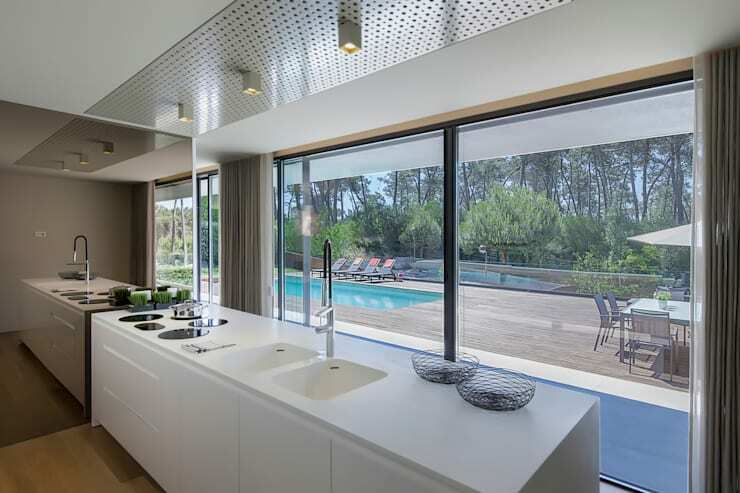 This amazing home, located in Portugal, comprises 600m2 of leisurely bliss, having been designed to display the spirit of a holiday house but to be used as a functional, full-time dwelling. Born of the creatives at Porto's INAIN Interior Design, the home impresses with its expansive layout and steady influx of natural light, with floor-to-ceiling glass panels framing much of the exterior. Inside the abode has been decorated with a sense of casual sophistication, perfect to accommodate a budding family. Multiple areas for relaxation and play have been included, from a traditional living room to a billiards room and home theatre. The primary bathroom is couched in luxury, finished in white and green stone and housing a contemporary, circular bath, while the bedrooms and en suites each exudes their own unique, colourful character. The crowning jewel of this stunning residence however, is undoubtedly its area for outdoor living. 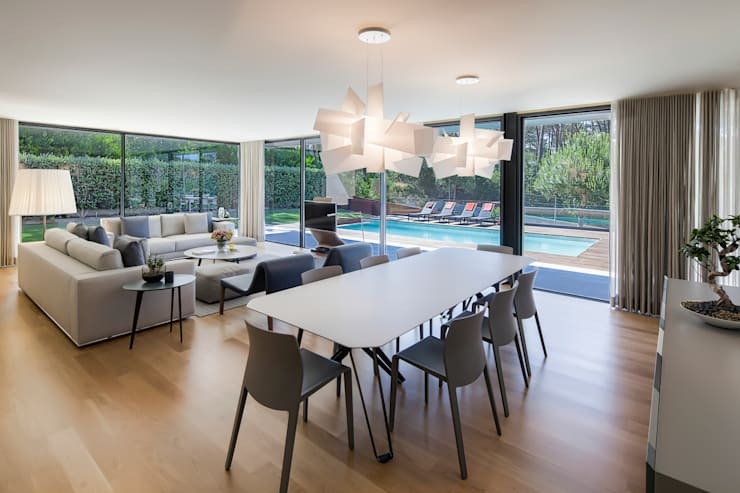 Comprised of flowing, timber decking and a lengthy swimming pool, the home's back yard presents the ideal locale in which to enjoy the Portuguese summer! This interior of this amazing home stuns with its open and airy plan and lovely view of the abode's back yard and swimming pool. White ceilings and pale, wooden floors are framed by floor-to-ceiling glass windows, which border the entirety of the home's rear facade, allowing ample light to permeate within and providing a lovely view of the surrounding greenery. The living room and dining setting seen here are comprised of understated, stylish pieces in a muted palette of grey tones, which help to infuse the space with a tranquil and soothing atmosphere. The home's kitchen glows in pristine white, with the glossy finish of its cabinets and bench exuding modern style and sophistication. The kitchen is beautifully framed, not only by the home's signature floor-to-ceiling windows, but by a panel of dark mirror, which lends a contemporary sheen to the space. A strip of perforated stainless steel runs overhead, housing a range of spotlighting to illuminate the space after dark. 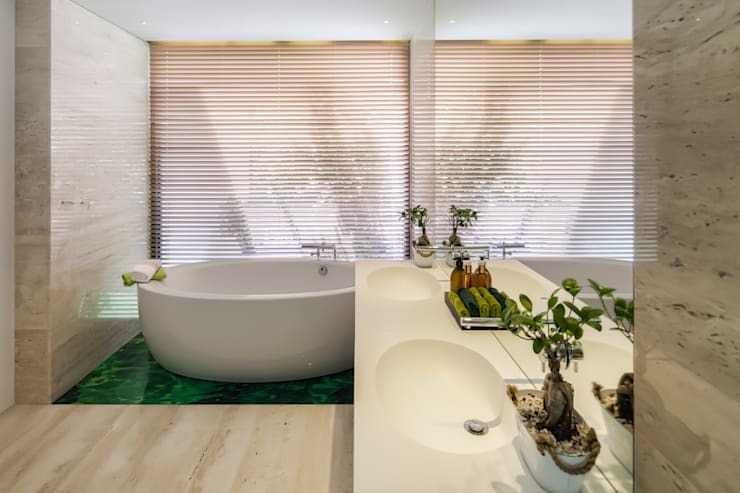 The primary bathroom emits the same sense of modern style as the kitchen, with its glossy, white sink and bathtub infusing the space with a soft and tranquil air by virtue of their curved designs. Reams of white stone finish the walls and flooring, while a square of emerald green stone adds a sense of vibrancy beneath the room's round bath. This impressive abode actually includes multiple areas in which the occupants can retire to relax or entertain themselves. This secondary sitting room has been decorated in the same chic, contemporary style as that seen in the living room above, and houses a lounge area, television and billiard table. 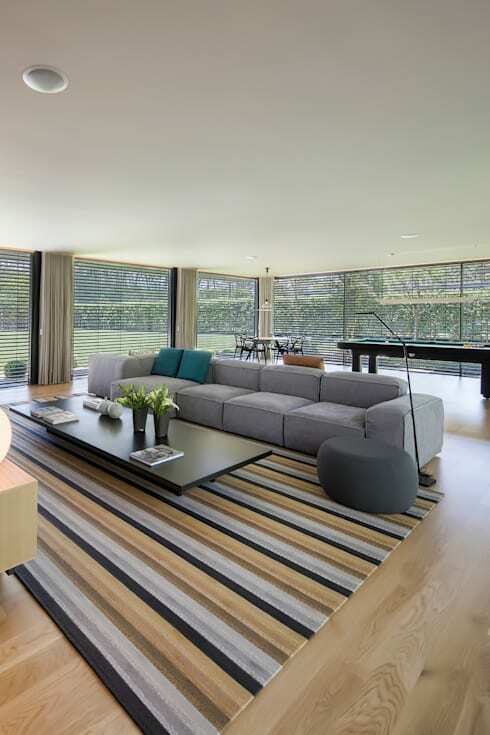 Expansive windows frame the space, but can be easily covered with blinds and curtains for a cosy sense of privacy. In addition to the living and billiard rooms, the house also includes a home theatre, in which the family can gather and relax in front of a movie. 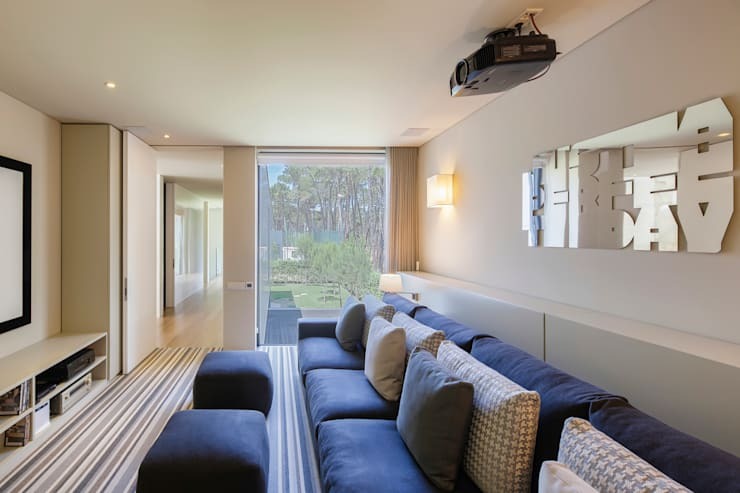 A voluminous, blue lounge suite provides a lengthy and comfortable vantage from which to enjoy a film beamed from the room's mounted projector. Meanwhile, thick curtains stand poised to shield the space from the distraction of daylight. 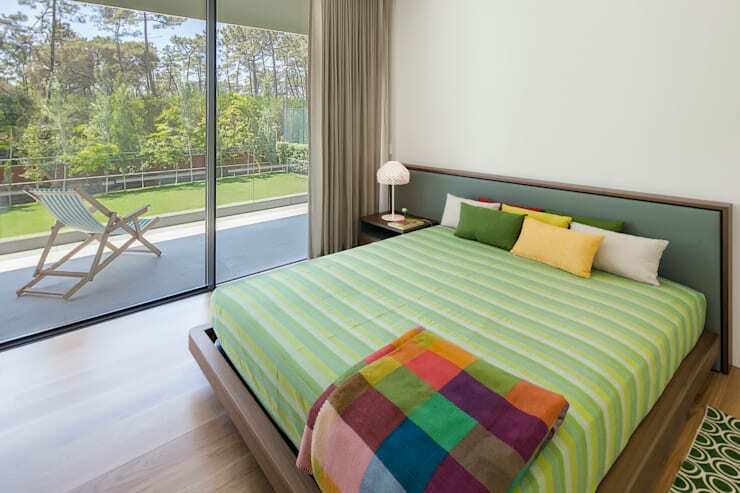 The bedrooms in this stunning property are light and spacious, with each benefiting from their own distinct character. Floor-to-ceiling windows also frame the upper level of the home, with this bedroom enjoying a lovely, simple balcony just beyond its sliding, glass doors. The simple decor within the space has been enlivened by brightly coloured bed linen, which exudes a playful and summery feel, creating a enjoyable atmosphere for the occupant. En suite bathrooms have been included throughout the home, with each also dressed in its own, unique style. 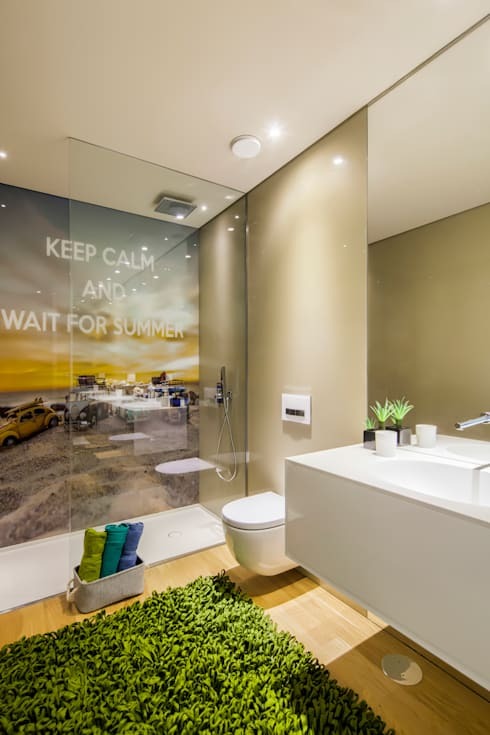 This space is decorated in simple decor of beige walls, white fittings and wooden floors, which has been elevated through the use of a graphic mural in the shower unit, and a grassy, green rug which sprawls across the floor. Moving through to the exterior of this incredible home and we're embraced by its flowing, timber deck and lengthy swimming pool. The designers have pulled out all the stops to ensure the occupants have plenty of options to relax and unwind, and this impressive area for outdoor living is no exception. This vantage also beautifully displays the array of windows framing the home's construction, with the reams of glass seen here resting in simple style beneath the cool grey of a concrete roof. Inspired by the relaxed luxury in this amazing home? Then take a tour of The Contemporary Countryside Manor for more design ideas! What leisurely features would you include in your dream holiday house? Tell us below!